I have met and talked to hundreds of individuals who call themselves Chief Financial Officers. Some work in the small to mid-market, some large cap all with varying degrees, certification, and experiences in different industries and sectors. What an overwhelming number of these fine men and women say in their “elevator pitch” is they can come into your company and cut costs. Anyone can cut costs! To steal a slogan from Nancy Regan; “just say no” and you have reduced a cost. Experienced business people can cut costs, so we can change the statement to all CFO’s, Controllers, accountants and bookkeepers can cut costs. Those CFO’s who claim in their elevator pitch that they can cut costs are tactical CFO’s. They fully involve themselves; immerse themselves; in this pursuit to the exclusion of most of the other aspects of being a CFO. 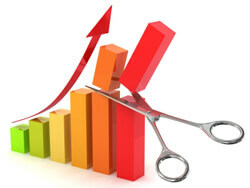 However, can you cut costs without damaging the business? Just like a surgeon, cut too deep and you damage the underlying organs or tissues and while you may cure the patient today, tomorrow the patient may make a turn for the worse or never regain full mobility. Nevertheless, we are moving away from my central thesis, “Why I never describe myself as a CFO that can cut costs”. Yes, I can cut costs. Yes, I can do it intelligently, and argue when cost cutting has exceeded the safe zone and the business will be damaged. I am not alone here in this skillset. However, if I convinced you to hire me; and my claim to fame is cost cutting; I am setting myself up for future issues. Think about it; I come into your business, it may take a year or so, and I am able to save the business a significant amount of money. I do it smartly and the business does not suffer much. A job well done! Then, what is my next trick? Most of the time you can only cut costs once, sometimes twice. Then what? What else can I do? I sold myself as a cost cutter. I performed and now it is time the business hires that strategic CFO it needs. I have indeed raised the bottom line, but how have I helped the organization grow? So what do I tell CEO’s? I tell them that I am a strategic CFO. I believe in cost mitigation. Mitigation includes intelligently controlling costs; which includes evaluating the way we do business. Evaluation requires a strategic vision of the business. A mapping of all processes and an on-going GAP Analysis program to root out stovepipes, waste and non-performing aspects of the business. While I do believe in cost mitigation, by using GAP Analysis and other tools (such as the development of metrics to assist in gauging effectiveness of business and programs) I also believe in empowering and growing top line revenues. How? By providing information that sales and marketing needs, based on their requirements. Giving them access to the data in formats that they want, not what I like. Teaching and encouraging their use of the tools provided to analyze the company data. By spending time with sales and marketing during their sales cycle. This means I go on sales calls. I meet our customers. I learn to understand the business from the revenue side. I learn what roadblocks there are in selling our product or service. I fully understand our value proposition. I empower sales to close the deal, by giving them the full understanding of where our break-even position is, and where it may pay to make a sale a loss leader. I also learn the business from the vendor side, by sitting in on the purchasing cycle. I visit vendors, and where these vendors actually produce specific product for the company, I learn their process. Now I am able to understand the practical issues that may be increasing our costs. Higher costs may make our products more difficult to sell. On the other hand, pricing may not be the reason we cannot increase revenue. That is why I sit with the marketing department. I want to understand the processes they use. I want to know: How do they find new customers? What methodology do the use to decide what new products and services to bring to market. I also want to provide them my point of view, from both the strategic and financial vantage, as well as diversity in businesses, markets, sectors and industries that I have acquired in business. It is for these reasons I can never describe myself as a CFO that can cut costs because if I do, I have painted myself into a corner, locked the door to the room and will never be able to get out. No disrespect intended to Gaston Leroux’s literary masterpiece “The Mystery of the Yellow Room”. The Back Office Matters – more than you think!